One of the final steps in the Application Process is the Retailer Interview. This is an opportunity for those candidates that have reached the latter stages of the process to meet their potential new employer. It’s important to be prepared and so we have compiled 5 great interview tips to give candidates a real edge! Remember, the Jaguar Land Rover Recruitment and Support Team are at the end of the phone to help if you need them and no question is a bad one. Doing the right research will stand you in really good stead and demonstrate that you are engaged with and genuinely interested in the job that you’ve applied for. You don’t need to be an expert as such…just ensure you know the top-line, important information. Why do you want to become an apprentice? Why do you want to be a Service Technician (or other)? 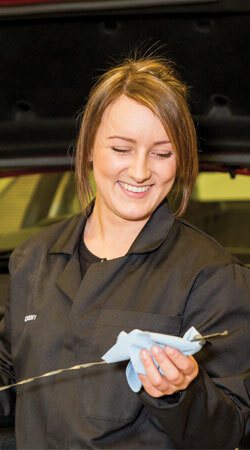 Do you know what a Service Technician (or other) does? What can you tell me about the Retailer Group (eg. Stratstones) that you’ll be working for? Practice telling someone (maybe a parent or guardian) why you’re applying, what the role entails and how enthusiastic you are. This will get you in the right mind-set. Appearances shouldn't matter, but the plain fact is that you are often judged before you've even uttered a word. Make sure your shoes are polished, your clothes fit correctly and that your accessories are suitable. Dressing one level above the job you're applying for shows a desire to succeed. The retailer will try and imagine you working for them. If you look like you’d fit in because you’re well presented, you’re one step ahead of those that don’t. Good preparation is the key to staying in control. Plan your route, allowing extra time for any unexpected delays and get everything you need to take with you ready the night before. Remember to speak clearly, smile and remember that your interviewers are just normal people, and they may be nervous too! The BEST tip we can give you is to ask the interviewer questions! Have 2-3 prepared before you go in (examples below). Asking questions DURING the interview (and not right at the end) makes the interviewer do some talking, moves the focus away from you for a while, allows you to focus and compose yourself and most importantly, intelligent questions demonstrate to the interviewer your engagement with and understanding of the opportunity. What’s it like to work here from your point of view? ​How will you support my learning and continual progression? Do you have any other apprentices? If yes, how many and how are they getting on? What are your ambitions for your new apprentice? The opportunity to embark on an apprenticeship should excite you. If it doesn’t, perhaps it’s not right for you. If the employer thinks that you’re enthusiastic, they’re more likely to be convinced that you’re right for the role and that you’ll work hard towards achieving your goals with them. Smile, shake them firmly by the hand, and talk positively about the opportunity and the environment. There’s nothing wrong with being yourself in an interview. If you can get along with the interviewer, the whole process will be so much more positive. If the interviewer makes small talk, jump on the opportunity and engage in the conversation. If you would like to download and print this information for reference, please follow the link below.